It's finally here! 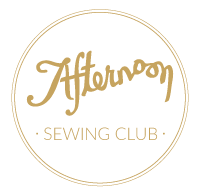 After months of threatening to host events and agonising over workshops, I now have the pleasure to present to you the Afternoon Sewing Club. More meet-up than lesson, more chit-chat than lecture, the Afternoon Sewing Club is here to give you a cool, relaxed space to explore your creativity. And pick up some badass sewing skills along the way! Fill in the form to book your spot, first come, first serve! It's starting small, but don't worry, as it takes off there will be plenty more workshops in future. You're invited to an afternoon of creativity as we guide you through the steps of making your own clutch bag. The workshop includes fabric, thread and sewing pattern. And wine. There will be wine. Your sewing machine (make sure you have a bobbin and a needle), paper scissors, fabric scissors, and an unpicker if you have one (hopefully you won't be needing it). Only four spots available. I have one sewing machine available to rent. Otherwise, the workshop is currently only open to those who can bring a sewing machine. Payment on the day via cash, card or SnapScan. Success! I'll get back to you as soon as I can. You can have a look at the clutch and the steps involved in making it in more detail on this blog post. I look forward to meeting you!